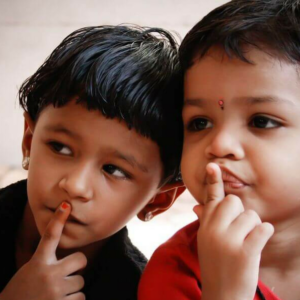 Kanchana Paati – My Grandma’s Place is a professionally managed 8 AM to 8 PM, multi-location childcare centre in Chennai city operational since 2006. A day in advance for the day care and after school. Two days for a crèche. One week advance for play and pre-school. Giving details of the center they are registered at and the center they wish to use. Roaming options may be exercised for a day, a week, a month or permanently. Since children explore and experiment, it is best to dress them in comfortable, easily washable clothes. Since we provide mineral water, snacks and food in our centers, parents are requested to send just a set of change clothes. (No water bottles, no snacks, and lunch boxes). Children who are admitted to our crèche service can bring special infant food which will be fed to them. They should also bring enough diapers and sterilized feeding bottles. Nursing mothers can visit the Kanchana Paati centers at fixed times during the day to nurse the child. 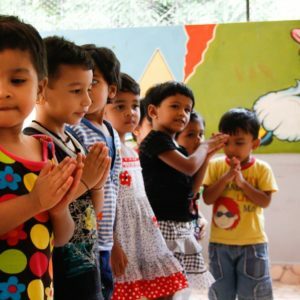 Kanchana Paati aims to provide a comprehensive, happy, stable and caring environment. In these surroundings, children of ages below years three and above can explore, enjoy, achieve and progress at their own pace to the fullest potential, through value – based education. Each center is well equipped indoors and outdoors to offer a wide range of art and craft activities that encourage imaginative play. Receiving hall where children are welcomed in the center. Activity area where the children paint, draw, clay model, play with toys, puzzles and books chosen by themselves from the open shelves. A siesta room is available for children to rest. DVD and TV without cable connection (are DVD’S are child friendly content). Notice boards in the receiving zone provide information to parents regarding the activities and events. Each Kanchana Paati center has a CCTV. Staffs are trained in First – Aid and use of the fire extinguishers. Invertors, dummy switches at all electrical points have been installed. Inspection of all electrical areas is conducted quarterly. Fully equipped first aid box. Several systems have been in place for maintenance of the Kanchana Paati centre in order to provide a hygienic environment for the children. The Kanchana Paati centre is cleaned on daily basis. Cleaning and disinfecting schedule is maintained at the center. A staff member is trained to wash their hands every half an hour to prevent the spread of infections from one child to another. They wash their hands after taking children to the bathroom and before serving food to the children. A hand wash schedule will be displayed inside the center. Children are toilet trained from the age of one and a half years. Facilitators are trained to take action if a child needs medical attention. Monthly height and weight records are maintained for Play and Preschool children. Parents are requested to give written instructions with the name of the medicine, correct dosage, time and intervals at which medicine needs to be administered along with their signature. Medicine must be suitably labeled and in a proper container. In order to avoid the risk if infections spreading to other children, we will not be able to accept children with fever of 100 degrees F or more for the day, if the child develops a fever of 100 degree F or more during the day parents will be requested to take the child back home. Parents are requested to visit the pediatrician and keep the children at home if they show severe symptoms of cough, sore throat, runny nose, vomiting, diarrhea, restlessness or irritability. Closure of center during riots and natural calamities. Starting new activity (sports, fancy dress, etc..). Parental workshops, winter and summer camps. Free reminder and free receipts. We offer a 12 hours customer care for parents to give their suggestions, feedback and register their complaints. The center will respond tp complaints within 4 working hours and resolve them within 8 working hours. The Kanchana Paati customer care numbers is 9790930970 and the available timings are: Monday to Friday – 8 am to 5 pm. KanchanaPaati centers are established in convenient locations of the city. Open from 8am to 8pm – Monday to Friday. Open from 8am to 5pm – Saturday. Roaming access to all branches . Freshly prepared nutritious meals and snacks served at centers. Compulsory outdoor activities in the evening. After play, children will be bathed and groomed.